Is Shingles Contagious From Person to Person? Yes, people with shingles are contagious. According to the CDC, "people with shingles are contagious to persons who have not had chickenpox. Therefore, people who have not had chickenpox can catch chickenpox if they have close contact with a person who has shingles. However, you can not catch shingles itself from someone else. Shingles are caused by the chickenpox virus which has been dormant (staying quiet) in your body ever since you had chickenpox. So, you get shingles from your own chickenpox virus, not from someone else." Although shingles are contagious and can transmit the chicken pox virus to susceptible people, classic, localized shingles are not as contagious as chicken pox itself. While like shingles, you can get chicken pox "by touching or breathing in the virus particles that come from chickenpox blisters," you can also likely get chicken pox "through tiny droplets from infected people that get into the air after they breathe or talk." The droplet spread doesn't happen with shingles, though. You typically have to have direct contact with the shingles blisters for it to be contagious. That makes it much easier to avoid getting sick, which is important if your child is too young to get vaccinated and protected with a chicken pox vaccine. In general, if someone has shingles and can keep all of the zoster lesions well covered, then the children won't have direct contact with them and shouldn't be at much risk. Of course, the best way to avoid getting chicken pox is to simply get vaccinated with the chicken pox vaccine. Children get their first dose of chickenpox vaccine they are 12 to 15 months old. The second dose of the chickenpox vaccine can be given any time, as long as it is at least three months after the first dose, but it is typically given when kids are 4 to 6 years old, just before they start kindergarten. Although you should still take steps to avoid contact with the shingles blisters, someone who has had chickenpox (natural immunity) or two doses of chickenpox vaccine should be well protected if they have to be around someone with shingles. If your child is unvaccinated (and at least 12 months old) or has only had one dose of chickenpox vaccine (and it has been three months since their last dose), getting vaccinated within 3 to 5 days of exposure to someone with shingles might decrease their risk of getting chicken pox (post-exposure vaccination). 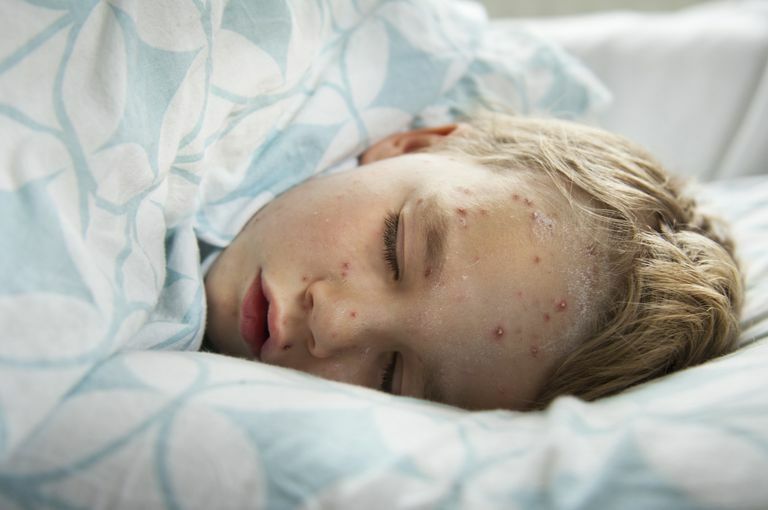 Symptoms of breakthrough chickenpox—getting sick after being vaccinated—are usually much milder than natural chickenpox infections. Although a shingles vaccine is also available, it is for people who are at least 60 years old to help prevent them from getting shingles. What about the idea that the expanded use of the chickenpox vaccine is causing a surge in shingles cases or a shingles epidemic? This is simply another anti-vaccine myth that is used to scare parents away from vaccinating their kids and protecting them against vaccine-preventable diseases. The trend in rising shingles cases in adults began before we started giving kids the chickenpox vaccine in the United States and the trend in rising shingles cases in adults exists in other countries that do not routinely give kids the chickenpox vaccine. If your child is exposed to someone with shingles, whether or not they have been vaccinated, watch them for the development of chicken pox blisters over the next 10 to 21 days—the incubation period for chicken pox. CDC. Preventing Varicella-Zoster Virus (VZV) Transmission from Zoster in Healthcare Settings. DEYOUNG GR. Herpes Zoster Virus Vaccine (Zostavax) for the Prevention of Shingles. Am Fam Physician - June 15, 2007; 75(12); 1843-1844. Feder HM Jr. Herpes zoster in otherwise healthy children. Pediatr Infect Dis J - 01-MAY-2004; 23(5): 451-7; quiz 458-60. Is the Chickenpox Vaccine Causing a Shingles Epidemic?